Metabolic regulation of ghrelin O-acyl transferase (GOAT) expression in the mouse hypothalamus, pituitary, and stomach. Abstract Ghrelin acts as an endocrine link connecting physiological processes regulating food intake, body composition, growth, and energy balance. Ghrelin is the only peptide known to undergo octanoylation. The enzyme mediating this process, ghrelin O-acyltransferase (GOAT), is expressed in the gastrointestinal tract (GI; primary source of circulating ghrelin) as well as other tissues. The present study demonstrates that stomach GOAT mRNA levels correlate with circulating acylated-ghrelin levels in fasted and diet-induced obese mice. In addition, GOAT was found to be expressed in both the pituitary and hypothalamus (two target tissues of ghrelin's actions), and regulated in response to metabolic status. Using primary pituitary cell cultures as a model system to study the regulation of GOAT expression, we found that acylated-ghrelin, but not desacyl-ghrelin, increased GOAT expression. In addition, growth-hormone-releasing hormone (GHRH) and leptin increased, while somatostatin (SST) decreased GOAT expression. The physiologic relevance of these later results is supported by the observation that pituitary GOAT expression in mice lacking GHRH, SST and leptin showed opposite changes to those observed after in vitro treatment with the corresponding peptides. Therefore, it seems plausible that these hormones directly contribute to the regulation of pituitary GOAT. Interestingly, in all the models studied, pituitary GOAT expression paralleled changes in the expression of a dominant spliced-variant of ghrelin (In2-ghrelin) and therefore this transcript may be a primary substrate for pituitary GOAT. Collectively, these observations support the notion that the GI tract is not the only source of acylated-ghrelin, but in fact locally produced des-acylated-ghrelin could be converted to acylated-ghrelin within target tissues by locally active GOAT, to mediate its tissue-specific effects. Gahete MD, et al., Mol Cell Endocrinol. 2010 Apr 12;317(1-2):154-60. Epub 2009 Dec 23. Expression of the ghrelin and neurotensin systems is altered in the temporal lobe of Alzheimer's disease patients. Abstract Ghrelin and neurotensin (NTS) are neuroendocrine peptides that exert opposite effects on food intake and energy homeostasis, but share comparable actions in improving memory and learning. Ghrelin and NTS mediate their effects via receptors with high evolutionary identity: two ghrelin G-protein coupled receptors (GPCRs; GHS-R1a/1b) and three NTS-receptors, two GPCRs (NTSR1/2) and one non-GPCR (NTSR3). Because ghrelin and NTS systems are tightly linked to energy balance regulation and cognitive processes, they have been proposed to be altered in Alzheimer's disease (AD), a dementia syndrome markedly influenced by the metabolic status. Although it has been demonstrated that ghrelin and NTS can attenuate AD-related cognitive impairment, a comprehensive analysis of these systems in AD has not been conducted. Here, we used quantitative real time-RT-PCR to analyze expression of the ghrelin/NTS axis in one of the cortical regions most affected in AD, the temporal gyrus. Results unveiled a striking reduction of mRNA levels for ghrelin, and its newly discovered In2-ghrelin variant, as well as for the enzyme responsible for ghrelin acylation, ghrelin-O-acyltransferase and GHS-R1a, while expression of GHS-R1b was markedly increased. In addition, expression levels of NTSR1 and NTSR2 were profoundly decreased in AD, whereas mRNA levels of NTS only declined slightly, and those of NTSR3 (which is involved in neuronal apoptosis) did not vary. Taken together, our results provide the first quantitative evidence showing that ghrelin/NTS systems are markedly altered in the brain of AD patients, thereby suggesting that these systems may contribute to the severe cognitive deficit observed in this pathology. Gahete MD, et al., J Alzheimers Dis. 2010;22(3):819-28. The mouse ghrelin gene contains 5 exons (Ex), with Ex2-Ex5 encoding a 117 amino acid preproprotein that is processed to yield a 28 amino acid mature peptide. The current study examined if pituitary (PIT) and hypothalamus (HPT) ghrelin expression is up-regulated in response to fasting and down-regulated in obesity, as previously reported in the stomach. In the process of establishing a quantitative real-time RT-PCR system to accurately assess the changes in PIT and HPT ghrelin mRNA levels, we observed that primer sets located in Ex2 and Ex3 amplified a ghrelin transcript that contained the entire intron 2 (In2). Size and sequence analysis of RT-PCR products using multiple primer sets located throughout the ghrelin gene suggested that the In2-ghrelin variant contains Ex2 and Ex3, but lacks Ex1, Ex4, and Ex5. In2-ghrelin variant mRNA was not detected in stomach extracts, while expression levels were 10- and 50-fold greater than that of the native ghrelin transcript in the PIT and HPT respectively. In2-ghrelin variant mRNA levels increased in the PIT after 24 h fasting and decreased in the HPT and PIT of diet-induced obese mice. These changes may be due to the changes in circulating insulin or IGF-I, since both decreased In2-ghrelin variant expression in a mouse HPT cell line (N6) and in primary mouse PIT cell cultures. The fact that In2-ghrelin variant mRNA levels are dependent on energy intake in the PIT and HPT suggests that this transcript may encode a peptide important in coordinating the neuroendocrine response to metabolic stress. 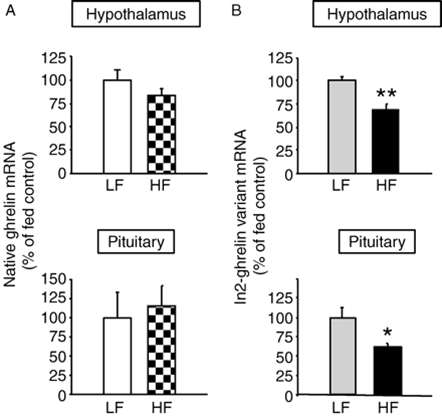 Hypothalamic and pituitary native ghrelin (A) and In2-ghrelin variant (B) mRNA levels of C57BL/6J male mice fed a low-fat (LF) or high-fat (HF) diet for 16 weeks (starting at 4 weeks of age; n= 6 mice per group). Both ghrelin transcripts mRNA copy numbers were corrected by cyclophilin A mRNA copy number and values are shown as means? mRNA values are expressed as percent of LF diet control mice (set at 100%). Asterisks (*P <0.05, **P<0.01) indicate values that differ from fed controls.